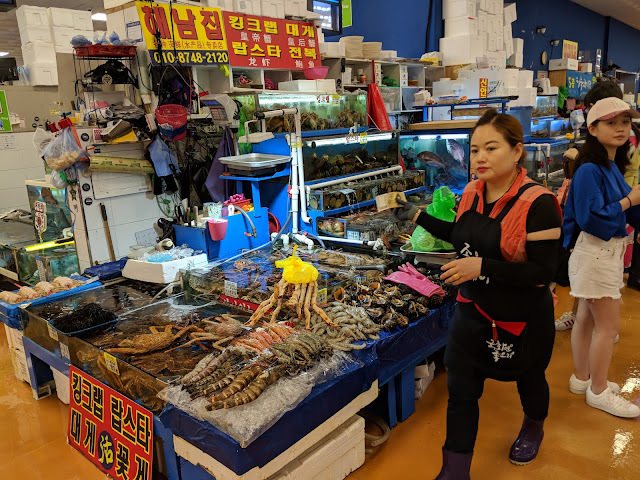 The highlight of my Seoul trip was eating live seafood at Noryangjin Fisheries Wholesale Market. It was such an unforgettable memory. It is very accessible as it is just minutes away from the metro station. 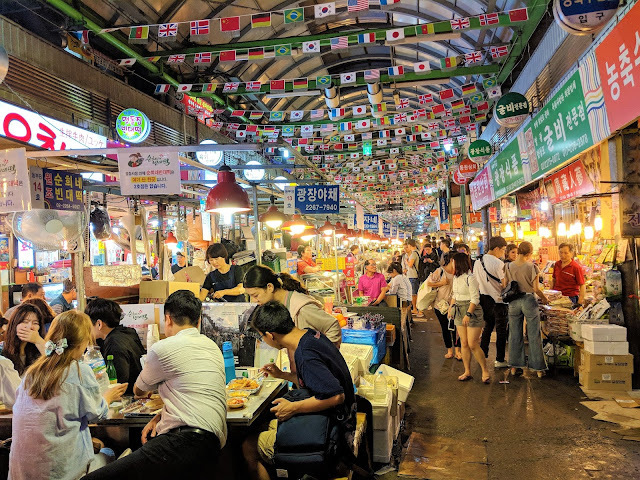 Noryangjin is the largest and oldest fish market in Seoul, dating all the way back to 1927. 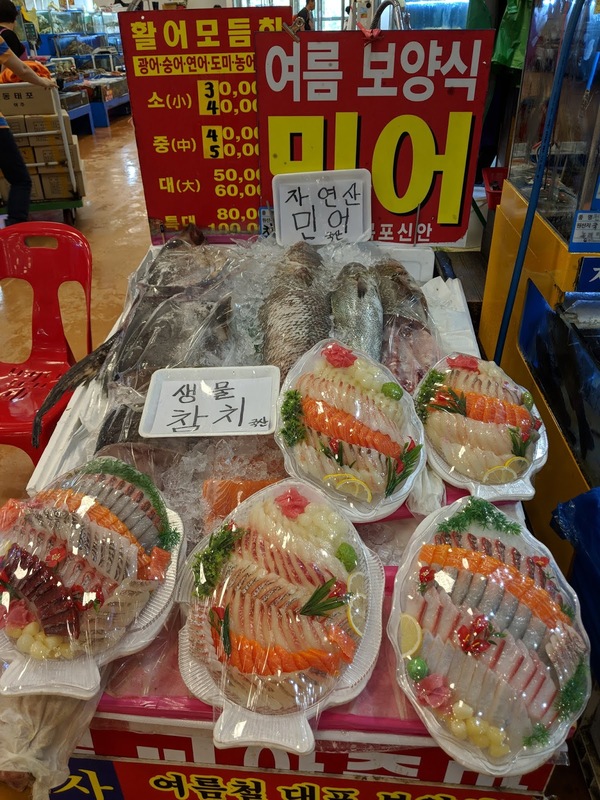 According to seoulguide.com, there are wholesalers fighting over fish during the morning auctions from 4am to 6am. I am not into waking up that early so I chose to arrive in the afternoon. 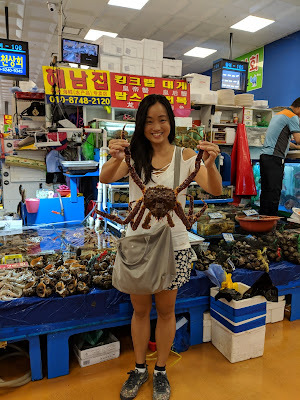 I am going to share with you my live seafood adventure, including how to choose, how to buy and what to expect! 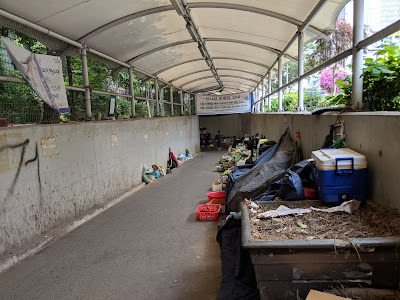 I expected the market to be crowded but when I arrived in the afternoon, there were not many people. 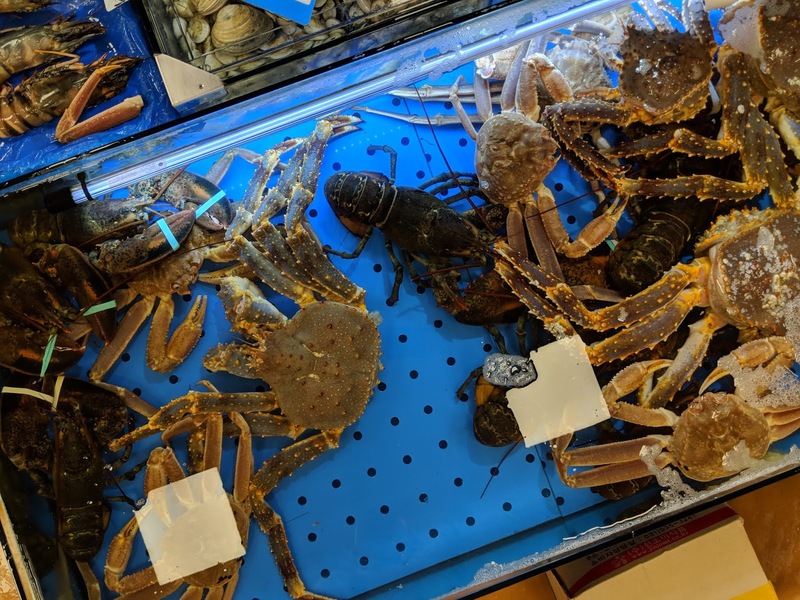 There were many stalls selling all kinds of seafood. 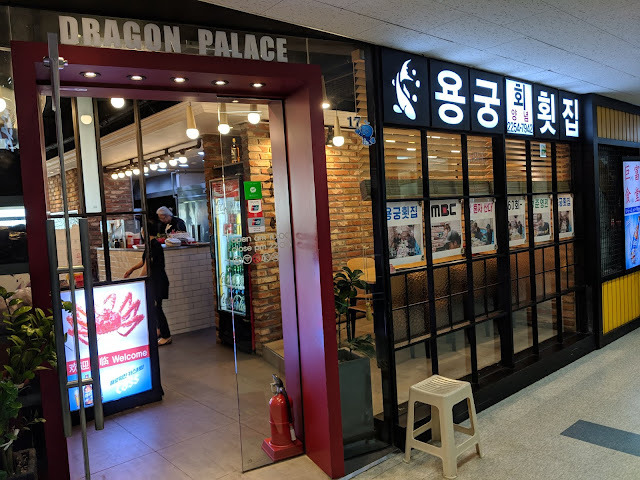 Noryangjin is definitely the place for seafood lovers and that is me! Click on video to view highlights! 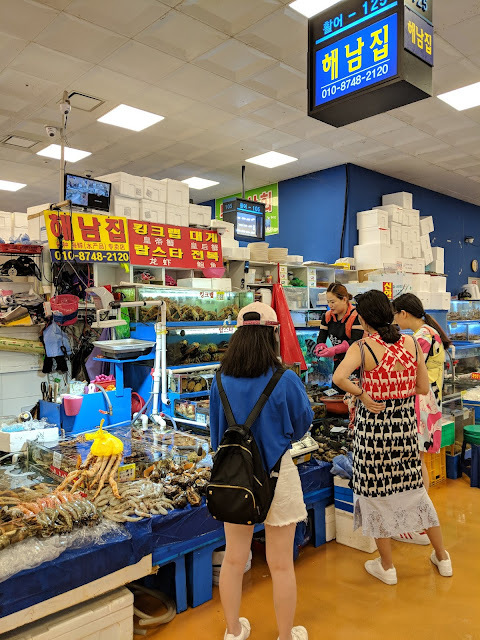 How to enjoy buying Live Seafood at Noryangjin Fish Market? 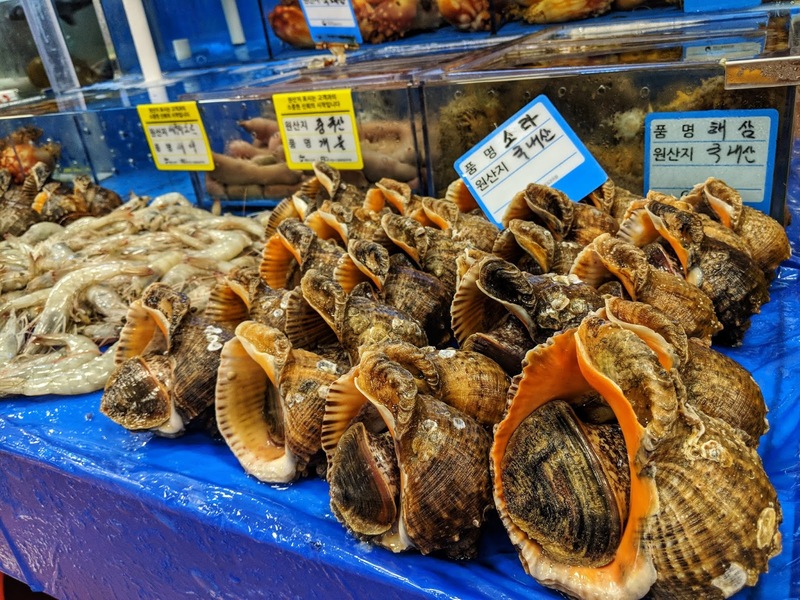 One of the reasons why Noryangjin is highly recommended is the reasonable prices of the live seafood. 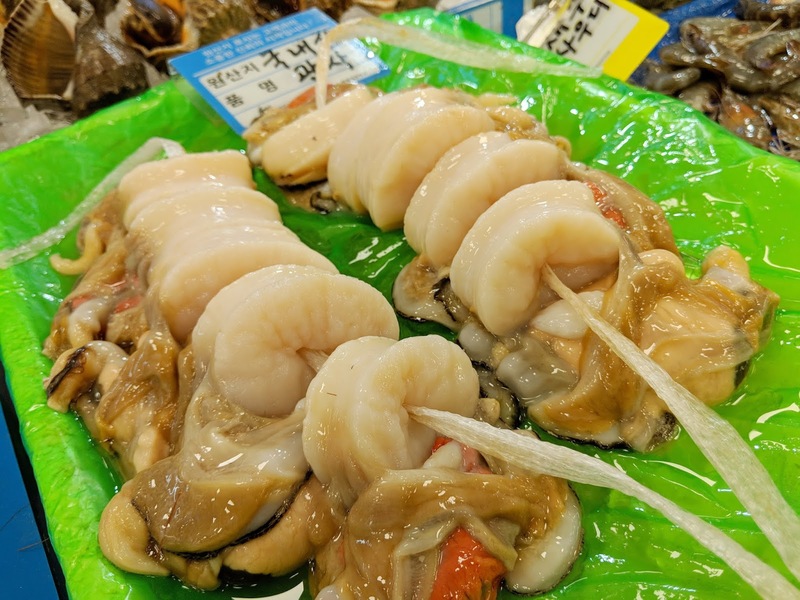 A live octopus costs around S$7 at Noryangjin but S$18 at Gwangjang market, famous for Korean street food. 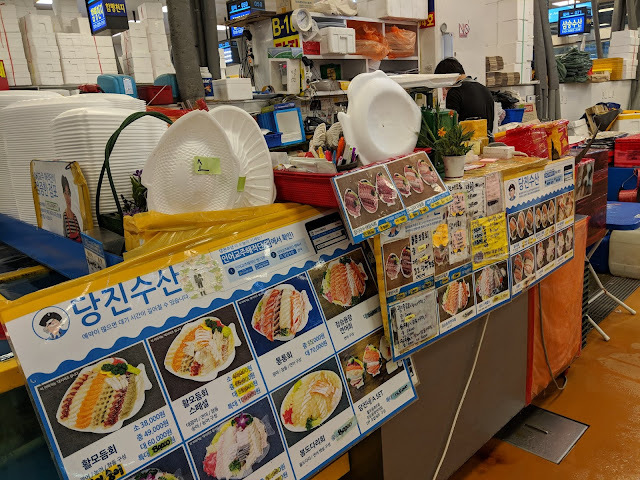 I walked around the stalls to have a gauge of the prices at Noryangjin. 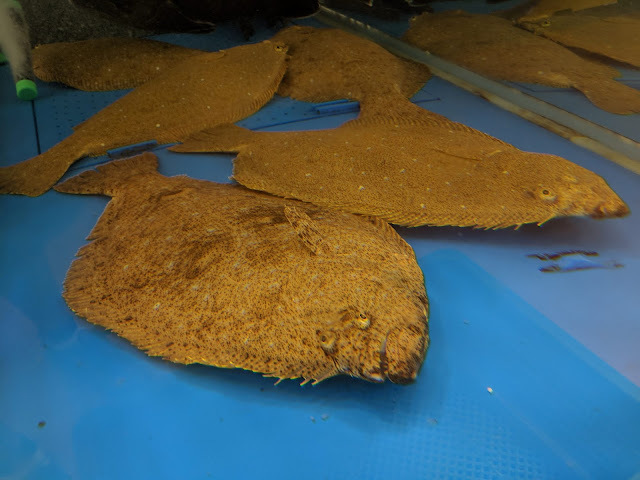 The prices did not differ too much and they were selling similar exotic sea creatures. 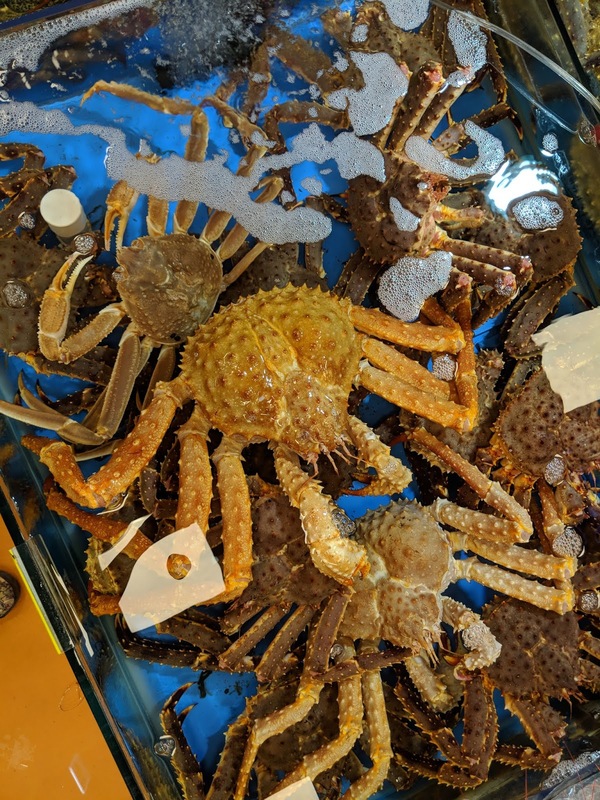 Some of the sea creatures such as crabs were sold based on a certain price per kilogram. I made sure I agreed on the weight and price before committing to a purchase. 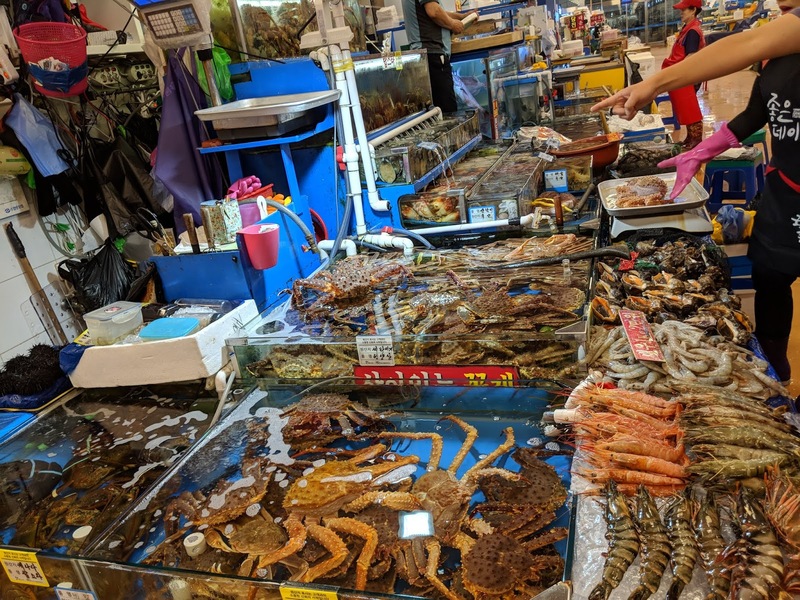 Many stalls selling live seafood! I don't speak Korean and they don't speak English. it was daunting, to be honest. I did not know where to start and how to even start buying. When a lady came up to me and spoke in Mandarin, I was relieved. I certainly did not want any miscommunication especially when it comes to buying seafood from a market. You need to to be able to communicate the price per kg for some seafood and state how many you want for others. The fish market comprises many stalls selling live seafood at Level 1 such as the one in the picture above. There are also some stalls located at Level 2. There is an escalator to access Level 2. Level 2 comprises mainly of restaurants. 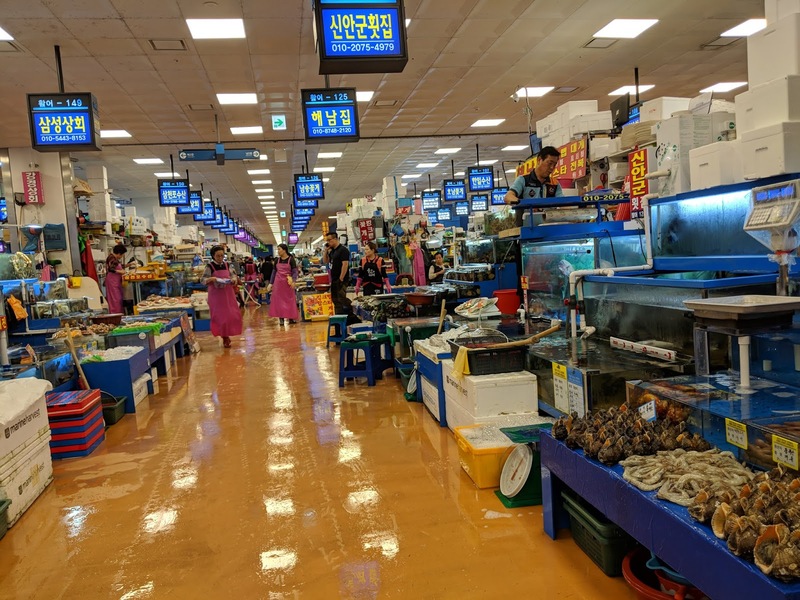 It was an interesting experience just discovering the sea creatures being sold. Just as I was doing my window shopping, a lady spoke to me in fluent Mandarin and started showing me her Alaskan King Crabs. She even thrusted one in my hand and indicated that it was okay not to buy from her but to have some fun in the market. This was a good sales tactic because I ended up buying from her haha. 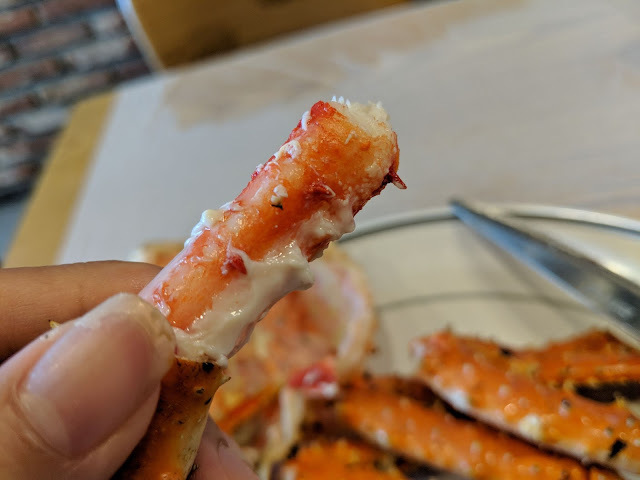 After checking out the various sea creatures, I settled on something that I always wanted to try - a King Alaskan Crab! I also chose two big abalones for S$8! In Singapore, 1 abalone can cost S$30! I love Noryangjin! Have you ever watched videos of people eating live octopus? I am always curious how it tastes like. I chose 1 octopus for S$7. The nice lady at the stall picked up the smallest crab for me and told me that it cost around S$40. I thought it was very reasonable for such a big Live Crab. She even asked me to pose with my prey and helped me to take pictures. I must admit it was rather exciting to touch the rough shell. After the lady had put all the live seafood in a bag, a man then appeared and took over the bag. He would be leading me to the restaurant. 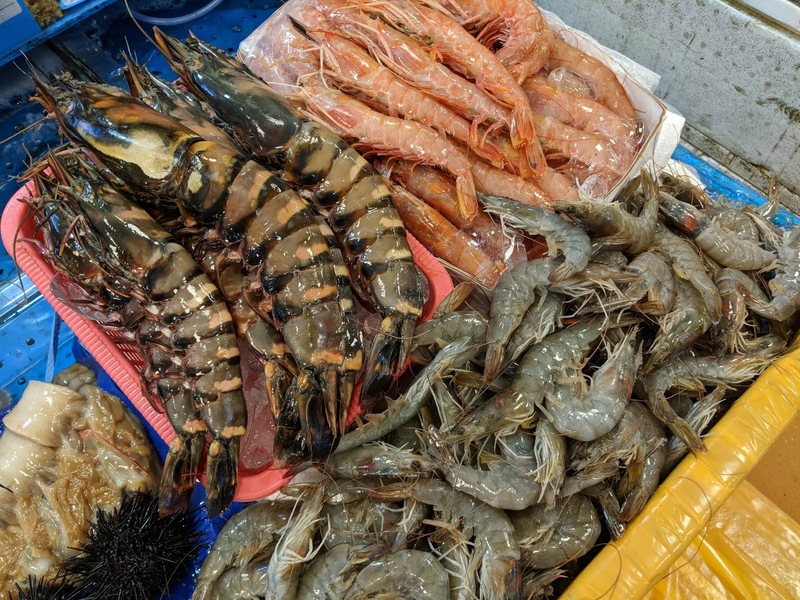 The price of cooking the seafood was around S$20. I thought it was reasonable. 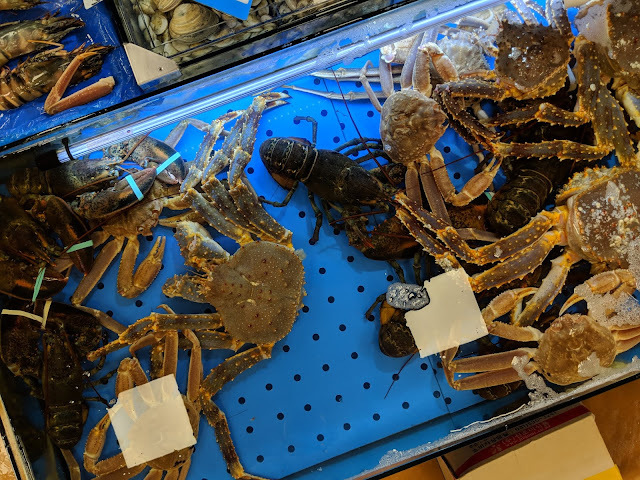 On hindsight, before buying the seafood, I should have asked for the price of cooking. I was also surprised that I was not able to choose the restaurants. I thought that I would be able to take my bag of live seafood to any of the restaurants upstairs. The restaurant that was designated for me was good, in terms of the cooking but it wasn't "traditional Korean" looking enough. 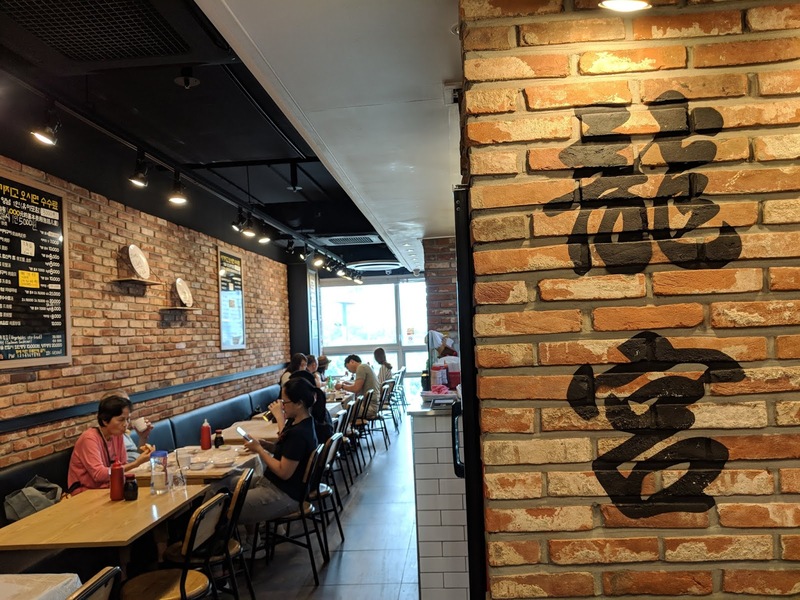 It looked more like a modern Chinese restaurant. As the seafood were live, I thought it was best to choose the simpler methods of cooking. I decided to steam my Alaskan Live Crab and grill the abalones. As for the Live Octopus, there wasn't a need to choose any method except to prepare my heart for it. 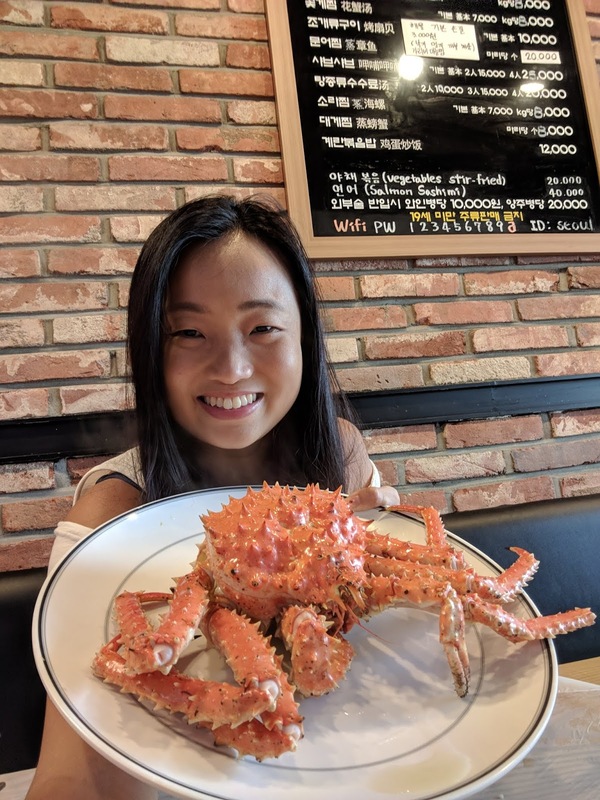 Eating Live Seafood at Noryangjin! I still remember my excitement as I was waiting for my fresh seafood to arrive. The abalones came first. They were grilled live. The one on the right had been eaten partially by me. It looked exactly like the ones in the can that we always eat during Chinese New Year in Singapore. 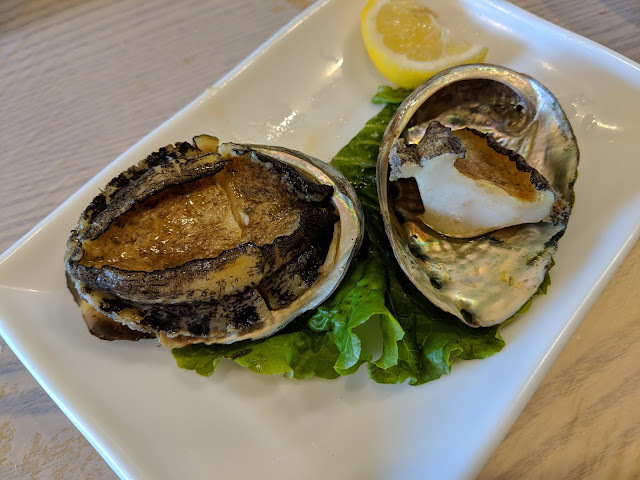 The texture of the fresh abalone was similar to the canned ones, maybe a tad softer. It was also not as salty. Overall, it was a good experience! S$8 for 2! Coming up next was the steamed crab. It was so delicious that I thought it was better to steam my abalones too. Dish of the day - Steamed Alaskan King Crab! 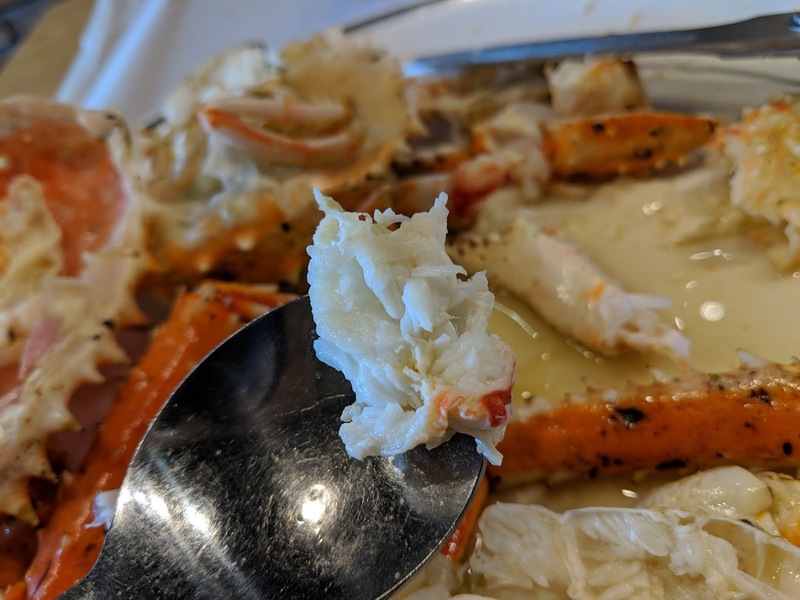 When the steamed Alaskan King Crab was served, the aroma of seafood wafted in the air. It was amazing. There was a lot of meat, sweet and juicy. It could easily serve 4 pax but my stomach is as big as the universe so I enjoyed every bit of the Alaskan King Crab experience. 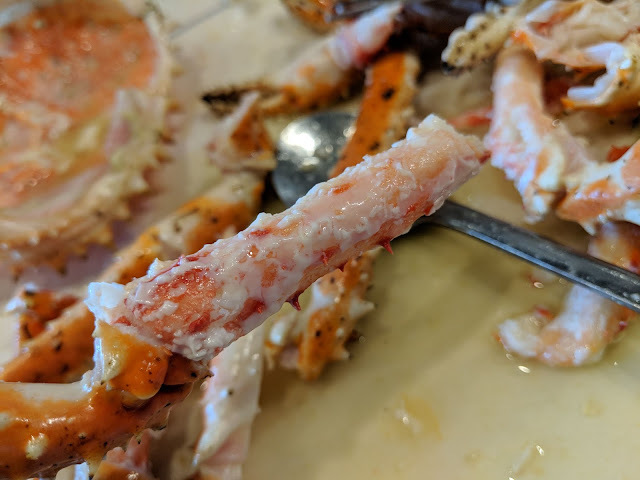 I took some pictures of the delicious crab meat. Enjoy! Check out the crab juice. 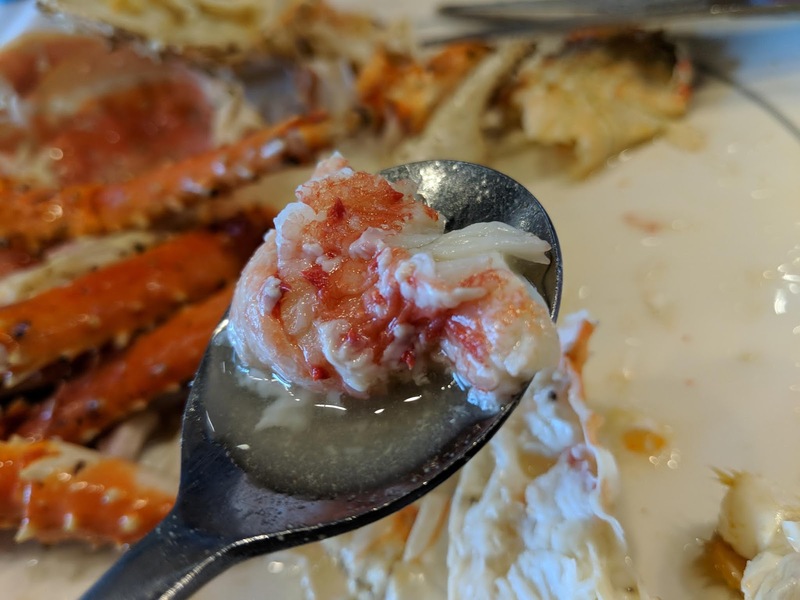 The most enjoyable part was actually the generous amount of sweet tasting crab juice. There was so much of it that I could call it crab soup. 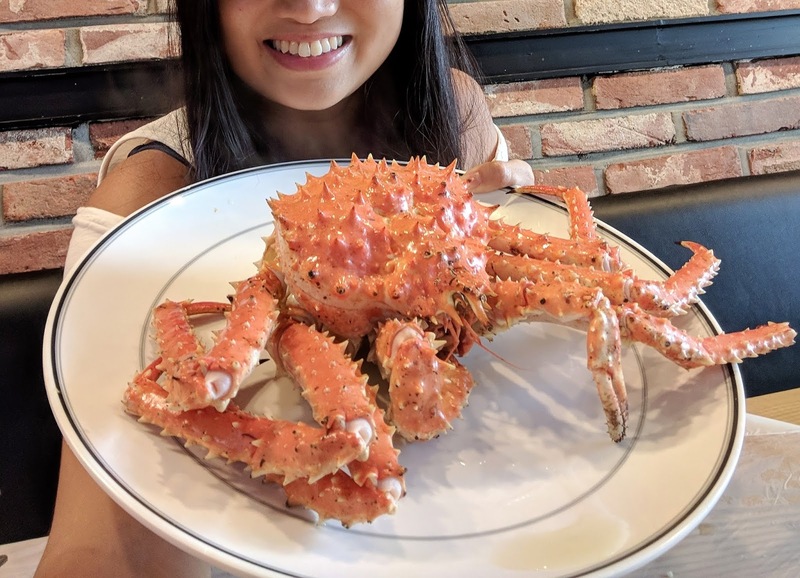 King Alaskan Crab is definitely a Must Try food experience at the market! I have seen countless videos of people trying the Live Octopus experience and I was very curious what it tasted like. I was hesitant too as I heard that the tentacles could stick onto your mouth. Eating Live Octopus is called San-nakji (산낙지) . Nakji means baby octopus in Korean. Koreans believe that eating San-nakji can boost one's inner energy or Qi. Some also say that the octopus was already dead when it was chopped. The wriggling movement was caused by the special nervous system, similar to the tail of a lizard when it drops. How does a Live Octopus taste like? The tentacles were wriggling like nobody's business. To be honest, I was a little scared but curiosity overcame me. I was afraid that it would wriggle inside my mouth. The moment it was in my mouth, it had no chance to wriggle as I started chewing immediately. The texture was chewy and a little similar to the marinated jellyfish we usually eat during Chinese Wedding dinners. The texture and taste of the octopus went very well with the sesame oil seasoning. It was so delicious that I finished everything after the initial inertia. I have taken some photos of the restaurant. I am satisfied with the taste, price and service. After my satisfying meal, I took another walk in the fish market. 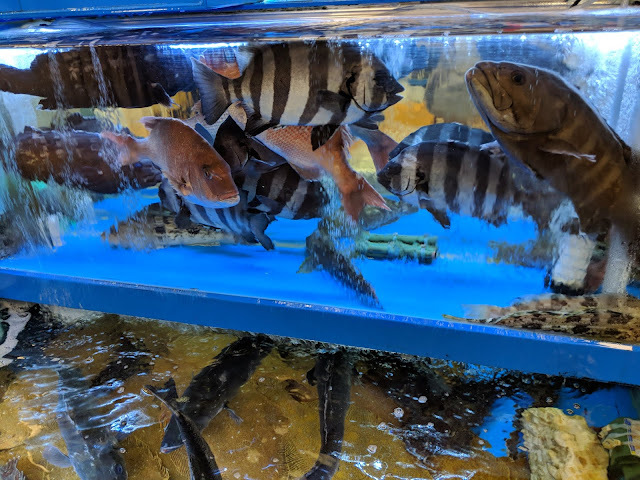 I saw some interesting fish for sale. There were also many stalls selling Sashimi. 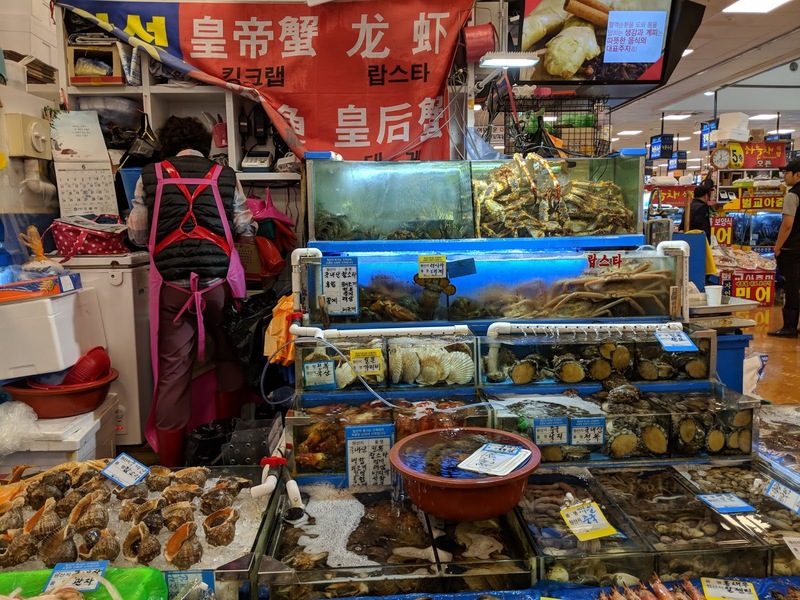 I returned to the Live Seafood stall which I had purchased my seafood from and she was busy serving customers. I took down the number of the stall for you and for the Future Me. I am grateful to the lady for her excellent service and ability to converse in Mandarin. Thank you for your friendliness! She was very busy and I managed to get a chance to thank her for the delicious foodie experience. I then started heading for the exit. On my way, I saw some really exotic looking fish, nice looking prawns and sashimi! This stall cut the Sashimi on the spot. I heard that you are delicious. How to get to Noryangjin Fish Market? It is very convenient. Just take the metro to Noryangjin and go out from Exit 1. I crossed the bridge and an underpass that looked like this before reaching the market that looked like a stadium from the outside. I had a fantastic experience and I hope that my food and travel story will also help others to have a good time with their loved ones, including themselves. Another unforgettable experience was my Traditional Korean Spa which I will blog soon. See you! Hugs.